Generally about 10 minutes from cold start or mod restart. In game seems fine. I'll add mine as well. modlist.txt - Modlist generated by the mod "[1.0] Modlist"
I'm also experiencing long loading times (fastest one is 20 minutes so far) though usually it's at 30 or more. Tried with "run in background" on and off. no real difference was noticed. I've got very long loading times, up to 60+ minutes at one time. As mentioned in this Reddit post (I'm OP), the save file was around 480 MB big. Mod RuntimeGC was telling me I had 56,000 dead pawns somewhere in the world, and the line count for the save file was 19 million. I've cleared them with RuntimeGC and loading time went down to 15 seconds (even tho right now is around 1 minute). I'm not sure I've done the log thing right, if not please let me know. At the same time, the Xfce taskmanager reported that Rimworld used "3,7 GiB" of memory, and, somehow, "26%" CPU… Since Rimworld tends to get killed by my OOM-killer (usually because I told him so, since Linux's OOM-Killer is pretty much the opposite of aggressive) after (very) long-ish play sessions (today it was after about 2h 15m), because my system gets unusable, I thought I'd report this, too. Maybe that's just how it is, because I use way too many mods, but maybe there's a memory leak, or something? Another thing: Rimworld seems to have some trouble starting up around the time that "BodyDef Squid has BodyPartRecord of SquidBody whose children have more coverage than 1." is written to the log, and it seems to take a few minutes for Rimworld to write any new entries into the log. I have no idea whether that's significant, a mod issue, or whatever, but I thought I'd mention it either way. Furthermore, I attached my modlist ("015h.xml") in the form of a "ModList" from Fluffy's Mod Manager. This way you get to see the mod names and Workshop IDs at a glance, and can easily import it, if that's needed. the overall performance of the game is pretty poor. It slows down a lot during the game and only reloading will bring it back to normal speed. Not sure its the modpack or the core though. I wish there was a multicore client support. Its 2019! Kenneth, investigate caching the patched XML. This one works for me to cut 2-3 minutes from my load of 7-10 minutes. Is there any way I could use that bit of code to speed up my loading times? Could I add this as some kind of mini-mod somewhere? I moved this thread to General since it's fair critical and we want to get as much info as possible. Thanks to all those giving info so far! 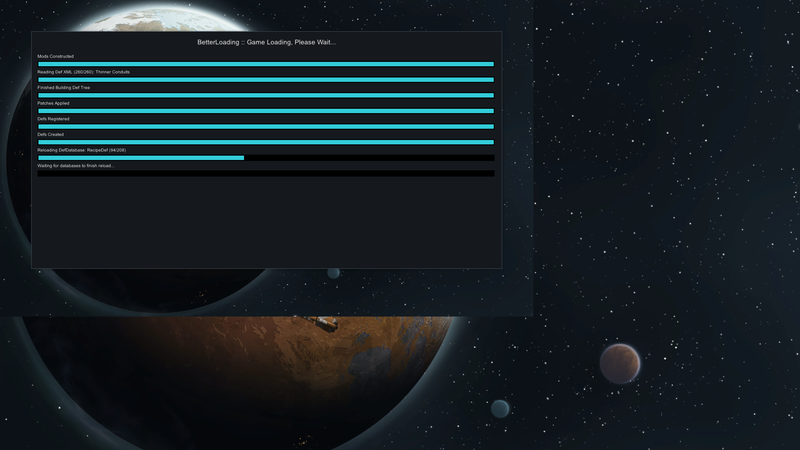 I don't know whether this question makes any sense, but should the loading times be shorter than they are, i.e. are they longer than expected? Hello just back again will there be updates to bring down loading times. I still have the same amount of time from when I last post to just get into the main menu. Noticed that it spends a large chunk of the loading time on step 'Reloading DefDatabase: RecipeDef'. That seems to be because I have a lot of race and animal mods, plus patches that inject recipes into those. So I can imagine the 'allowed' list getting huge for each recipe. Which may be an ineffective way of handling it when most recipes are along the lines of "available for all animals" or "for all humanlikes". Creadit to Zetrith for finding it. Basically, RimWorld does reflection every time it finds a type in XML. The more XML custom types the more reflection and reflection is slow. All mods use it. This patch makes it so there is a cache lookup before returing the type. Many report 2-4 times faster loading. So that is what speeds up loading times so much? Do you think these optimisations could be made into their own mod (unless the Devs decide to put this into Rimworld proper)? When I tried Zetrith's Multiplayer mod out, loading times went down from ~25min to less than 10, but I don't need the multiplayer part, and it doesn't play well together with my current modlist/save, anyway, so I can't use it. Preventing RimWorld from loading the preview images of mods saves a ton of ram, dramatically. It loads the preview files and keeps them in memory even if you aren't using the mods. It explains why my Steam takes so long to load while the SendOwl takes very little time. I have a ton of subscribed workshop mods. When categorizing the mods for the Multiplayer mod, Parexy had to subscribe to the 2000 available for 1.0, his ram would go up to 6GB! With this patch, his ram on load is 700mb. Dramatic difference! The ideal solution would be to load those files on demand, not every available mod at start up. Included the tiny compiled mod. I can confirm that my loading times drastically decrease with this, however, I've found that my world generation junks up pretty badly with my other 200 mods. Is there possibly a way to yank out that code and make it a mod in of itself for the purpose of self caching? here is the config any help would be helpful. I guess it's not that easy, since I already asked for it, as well, and notfood hasn't reacted to that, either. This is of course understandable, since that is neither her mod, nor should it be her that has to fix the game, because that's what this would basically be, if I understand it correctly, i.e. a bugfix mod. Additionally, none of the Devs (especially Kenneth, who has created this thread), have reacted to any of the three (!) possibilities to speed up loading times that notfood proposed, and Kenneth hasn't been seen in this thread since December 19, although Tynan himself has written that this thread is "fairly critical", because they want to fix this themselves. I guess they're busy doing something else, but it would still be nice if one of the Devs dropped in and maybe told us whether the info that gets posted here is even helpful to them, whether we are supposed to continue posting logs (even if we have posted one already), etc. No one, except myself, has looked at my log and my modlist, by the way, assuming the "downloaded x times" thingy is counting correctly.